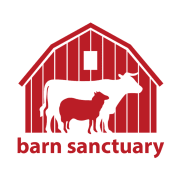 Barn Sanctuary is dedicated to rescuing and rehabilitating abused and neglected farmed animals by creating a safe haven where these individuals can recover, thrive, and serve as an example for why we strive to lead society towards a vegan lifestyle. Founded in 2016, Barn Sanctuary has rescued over 150 farmed animals in less than three years. More than 50 of those rescued individuals currently call Barn Sanctuary home. We strive to give our rescued residents the best care imaginable and provide them with the medical attention they deserve. The overall success of our mission benefits exponentially from volunteer involvement in animal care. Our volunteers are committed to giving the rescued residents the best life imaginable through assisting our Animal Care team in daily sanctuary chores that directly involve caring for the animals at Barn Sanctuary. In addition to our volunteer program, Barn Sanctuary's tour program draws hundreds of guests to the property to meet the animals and hear their stories. Our goal is to provide people with an opportunity to see farmed animals in a new light as we educate them about human relationships with farmed animals and the negative impact these current relationships have on the animals, our health, and the health of our planet. It is our hope that, through education, we can give people the information that will empower them to make more informed decisions about their own lifestyle. Additional programs are in the planning and development stages and we are looking for dedicated volunteers to join us on this journey! Would you recommend BARN SANCTUARY?